Our OLSAT® A workbooks help parents understand the content on the test, as well as provide ample practice questions to help prepare children for the exam. The OLSAT A is given to children currently in Pre-K or Kindergarten to enter either Kindergarten or 1st grade. Aristotle Circle promotes learning through play. In creating our colorful and effective OLSAT® workbooks, we leveraged our education and testing experts hands-on experience as well as feedback directly from children. 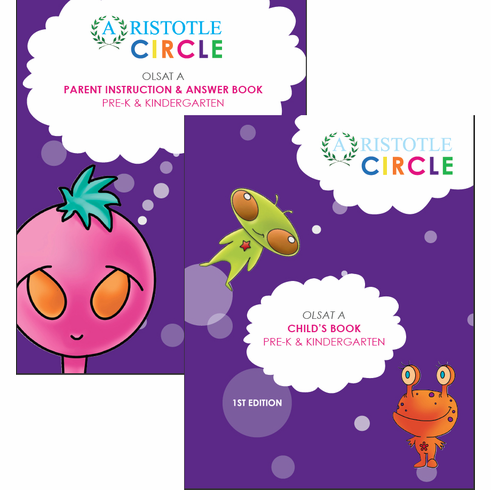 Our comprehensive and fun OLSAT® workbooks alternate black-and-white and color questions to keep children engaged while they learn. The OLSAT® workbook set also includes a complete 70-question black-and-white OLSAT® practice test. The OLSAT®Level-A test, for children in Pre-Kindergarten and Kindergarten, is comprised of 10 subtests that assess skills such as following directions, classification, identifying associations, establishing sequences, basic mathematical knowledge, analogies, and identifying similarities and differences.